The 2017 World Series is headed to a winner take all game seven because, well, of course it is. Riveting stuff, I know, but what else was one to expect from arguably the most dramatic World Series we have ever seen? In a set of games that has witnessed an unprecedented amount of uncertainty pitch by pitch, a game seven just feels right. Despite what baseball fans were feeling, there was an argument to be made that, on paper, the game six odds were in favor of the visiting Houston Astros as their ace right hander, Justin Verlander, took the mound. Coming into action on Halloween night, Verlander was a perfect 4-0 in five postseason appearances with four of those being starts. Emerging as one of the leaders in the Houston clubhouse, Verlander looked to give his team the edge in Chavez Ravine. The former MVP had given his Manager, A.J. Hinch, something very few managers get in the postseason, innings. Verlander had tossed at least six innings, impressive ones at that, in each of his four postseason starts, including one remarkable complete game against the New York Yankees that baseball fans will remember for years to come. You like any team’s odds when they send Justin Verlander to the mound, especially the 2017 Astros version, but the Los Angeles Dodgers didn’t exactly trot out a slouch. Rich Hill, a left handed curveball specialist, has been a large topic of conversation because of his great success in 2017, his age 37 season. Hill has always had the potential to be very hard to hit in this league and he has proven that over his career when he has been able to stay healthy and on the field. The whole world is seeing that now as Hill is having a very good postseason with his eighth major league club. Regardless of how good the starting pitching may be on any given night, this World Series has proven that both lineups are good enough to get the best of any hurler. However, that wasn’t the case early on in game six as we flew through five innings of baseball with just one run scored between both teams. The game’s lone run to that point came off of a George Springer solo home run with two outs in the top of the third. Fast forward to the top of the fifth, it looked as though the Astros may have had a chance to jump out to a decent lead with their best starting pitcher mowing through the opposition. Hill gave up back to back singles to Brian McCann and Marwin Gonzalez to start the frame. He bounced back to strike out the next two hitters, but Dave Roberts had seen enough. After an intentional walk to load the bases Brandon Morrow, who had a disastrous game five, was called on to get the Dodgers out of the jam. That is exactly what he did when he got Alex Bregman to groundout harmlessly to shortstop ultimately ending the threat and keeping this a one run ballgame. With the Dodgers hopes dwindling more and more by the pitch, Verlander was still tossing a shutout as we entered the bottom of the sixth where Austin Barnes was set to lead off. The Dodgers catcher got things started with a single before Chase Utley was hit by a pitch. Just like that, the Dodgers were in position to shift the game completely. After a mound visit, Chris Taylor, who may just be a household name after these playoffs, stepped into the batter’s box with a golden opportunity. He took advantage of Verlander’s tough spot and laced a game tying double. Corey Seager would push another run across with a sac fly to give the Dodgers a 2-1 lead as we headed into the seventh. 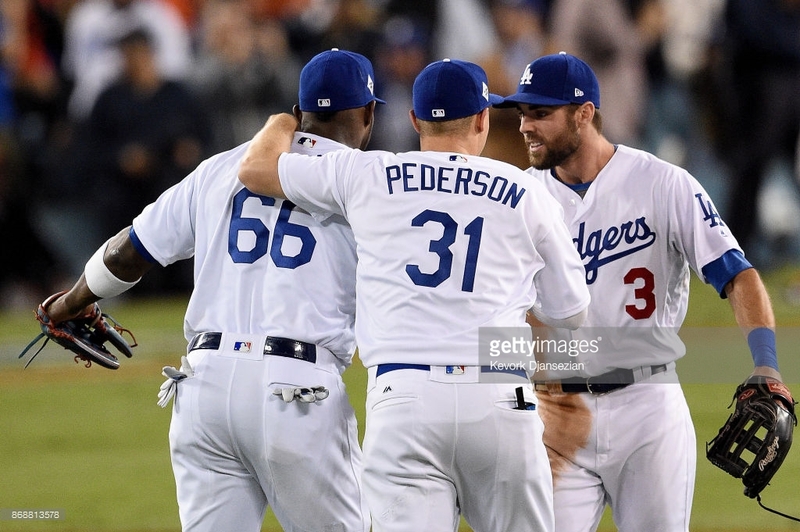 The Dodgers would never look back as they held the lead for the rest of the night. After getting an insurance run off of a Joc Pederson solo shot, which included a … dramatic… home run trot, the Dodgers bullpen would continue to shut things down and lock up a 3-1 victory. Game seven is set for tonight at 8:00 pm eastern as Lance McCullers Jr. squares off with Yu Darvish.